My strengths as a runner shine in long-distance road races. Heading to the track means leaving my comfort zone. Anxiety usually keeps me from showing up at the weekly track workouts with the local "speedsters" group. However, I know the only way to continue to improve in my sport involves adding speed work, which, until recently, I have avoided out of fear and intimidation. So, it may seem strange that I would voluntarily sign up for the "Masters Mile" in a collegiate track meet. 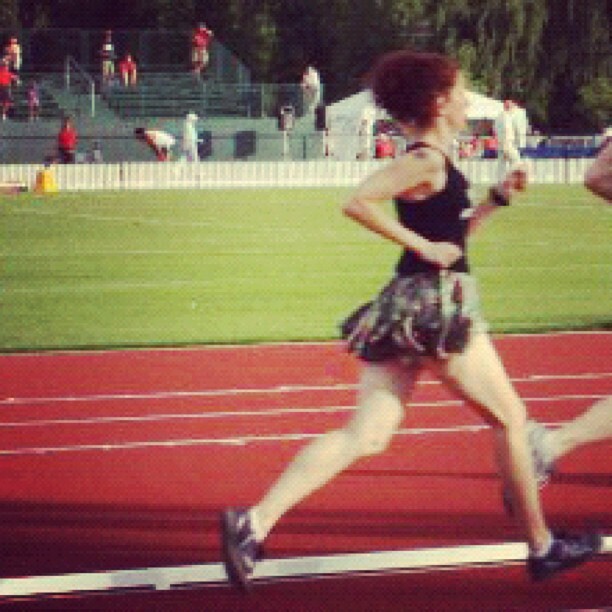 Even though I knew I'd be the slowest in the field, I decided I had to take a risk, put on my sparkle skirt and GO FOR IT! The “Masters Mile” was held Saturday at 6:45 p.m. during the University of Virginia’s “Virginia Challenge” track meet. I was one of 9 competitors ranging in age from 40-59 who ran 4 laps on the newly renovated Lannigan Track. I’m inspired by the other women runners, all moms, in their mid-late 40s who run fast enough to beat competitors half their age. In fact, at many local events, the female 40-49 age groups have faster times than those for 20-24! Finding a balance between being a mom, training, and working full-time, can be challenging, but it is so rewarding. I was honored to be a part of this unique opportunity. And, even though I finished in last place, I felt like a winner. 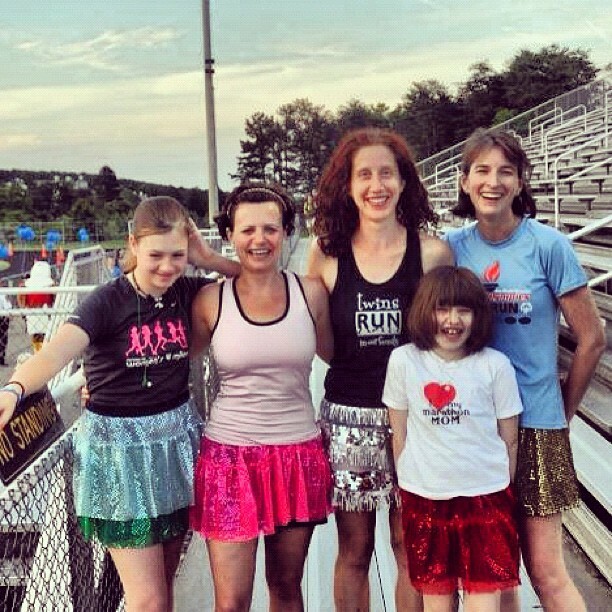 Ready to run in a rainbow of Team Sparkle skirts! After running at the UVA track, I immediately went to the next race, a two-mile remembrance walk/run for Jennifer Leigh Wells, who died in 2006 from meningococcal meningitis. The Jennifer Leigh Wells Moonlight Walk/Run for Meningitis Research raises money for the Children’s Hospital and Research Institute at Oakland (CHORI) – a non-profit organization, for B-strain meningitis vaccination research (the only bacterial strain that is not currently covered by the existing meningitis vaccination available). Cindy Payne, Jennifer’s mother, has found a way to honor her daughter’s memory by increasing awareness and raising funds for research. As the mom of a daughter, the race has a special meaning to me. Our lives can change so quickly and this evening reminds me to appreciate each day I have with my kids. Reflecting on my race . . .
was very special because I shared it with two of my friends. Both friends are returning to racing after suffering various injuries. I was thrilled to see them "sparkle" and run amazing award-winning times! Suzanna, sparkling in pink, came in 2nd overall. Diddy, shimmering in gold, won her age group! Proof that a little bit of sparkle, patience, and persistence can pay off! 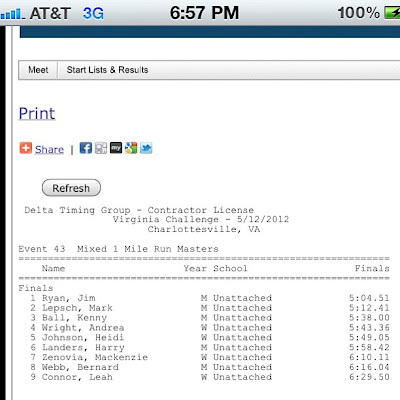 Charlottesville has an amazing running community! Write a blog post between May 13 – 19 about any focus on women’s health topic and leave a link to your blog on this post. Read fellow bloggers’ posts and share your thoughts. The goal is to get 100 posts listed in the comments section by the end of May 19! Follow the @FitnessBloggers blog challenge conversation on Twitter with #NWHWblog and learn more about National Women’s Health Week by following @womenshealth and #NWHW.